Q: How can we keep our sadhana in the middle of our daily activities? It is very difficult. AS: Ramakrishna was once asked this question, and in reply he gave the example of a child who was playing by spinning round and round. If you do this, you will soon get dizzy and fall over, but if the same child spins round and round while holding firmly onto a post at arm's length, the child's grip will keep him upright and prevent him from falling over. In this dizzy, spinning world of samsara, if you hold onto the post of the Self, you will be able to stay upright and not fall over. I can give you another example. When you cut jack fruits open with your bare hands, there is an unpleasant, milky liquid inside that sticks to your fingers and makes it very hard to take out that fruit. And afterwards it takes hours to scrub it all off. However, if you put a little oil on your fingers before you start the work, this milky liquid will not bother you because it cannot stick to your oiled hands. Without some protection, contact with worldly matters can prove to be sticky and unpleasant. But if you oil yourself with remembrance of the Self, you can move smoothly and efficiently through the world, without having any of your business affairs stick to you or cause you any trouble or inconvenience. When there is a remembrance of the Self, everything in life proceeds smoothly and there is no attachment to the work that is being done. Q: While you were doing a lot of work in the ashram, how did you manage to keep up your sadhana? 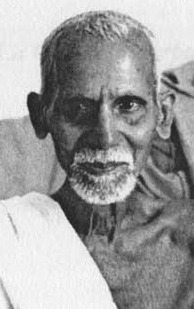 AS: In those days Bhagavan was accessible for most of the time, so I was able to get regular guidance in my sadhana. He told me to read Sivananda Lahari, Ellam Ondre, Upedesha Saram and his other writings. He also told me to do parayana (chanting of scriptural works). All this was very helpful in keeping my mind on the Self during work. Don't differentiate between work and meditation. If you don't differentiate, every job you do becomes meditation. And don't make distinctions between different kinds of work. Don't think, 'This is good work. That is bad work.' If you treat all work equally, any work you do will be beneficial for your sadhana.